Prime Minister Narendra Modi will launch Ayushman Bharat – Pradhan Mantri Jan Aarogya Yojana (AB-PMJAY) on Sunday at Ranchi, Jharkhand. 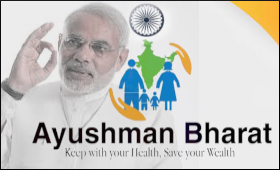 With Ayushman Bharat – Pradhan Mantri Jan Aarogya Yojana, the government is taking healthcare protection to a new aspirational level, said an official release on Saturday. This is the "world's largest government funded healthcare program" targeting more than 50 crore beneficiaries, it claimed. Ayushman Bharat- Pradhan Mantri Jan Arogya Yojana will provide a cover of up to Rs. 5 lakhs per family per year, for secondary and tertiary care hospitalization. Over 10.74 crore vulnerable entitled families (approximately 50 crore beneficiaries) will be eligible for these benefits. 30 states and UTs have signed the MoU and have started working on implementation of the mission. Maharashtra has joined on 14th August 2018. MoU has been signed with Tamil Nadu on 11th September 2018.